Love or Marketing? MarketingProfs Webinar | Andy Sernovitz | Damn, I Wish I'd Thought of That! 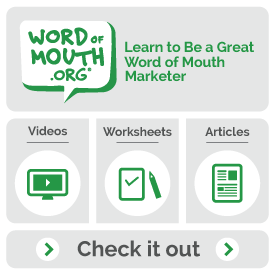 Join me for a live webinar with MarketingProfs on how word of mouth will save your brand. Your brand isn’t what you say it is — it’s what people tell their friends it is. Word of mouth marketing is the art of creating a company that people love to talk about. You need passionate fans who promote your brand because they love you and love what you do — and who talk about you out of this love, not for money. In this 90-minute webinar, you’ll learn specific strategies to connect and excite consumers and generate positive word of mouth. We’ll talk about the practical steps to create immediate, sales-driving conversations. Remember: When you earn the respect and recommendation of your customers, they will do your marketing for you, for free.